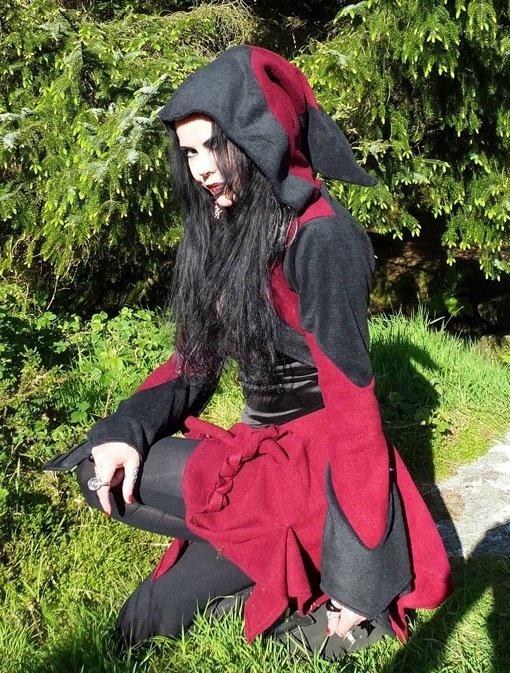 Wow, this a snugly little Bolero with a big personality and a massive hood :D<br> <br> Made from our fleecey snugglegoth fabric, it's made up with two colourwaus, we’ve used black and claret and as you can see it’s pretty stunwah - choose your own combination below!! <br> <br> It is fastened by a single froglet at the font and has pointy sleeves and a pointy hemline at the back.<br> <br> It rocks! And looks perfect with our newAmanita Mini Skirt! Made from our fleecey snugglegoth fabric, it's made up with two colourwaus, we’ve used black and claret and as you can see it’s pretty stunwah - choose your own combination below!! It is fastened by a single froglet at the font and has pointy sleeves and a pointy hemline at the back. It rocks! And looks perfect with our newAmanita Mini Skirt! Only 191 days 'til Halloween!